[Editor's introduction. The Chicago Teachers Union presented research testimony against the claims by Chicago's charter schools that the charters are "underfunded" and should be receiving even more money from CPS. The following is the May testimony by CTU researcher Sarah Hainds before the Illinois General Assembly debunking the claims about Chicago charter schools that had been given earlier by charter school executives and supporters]. 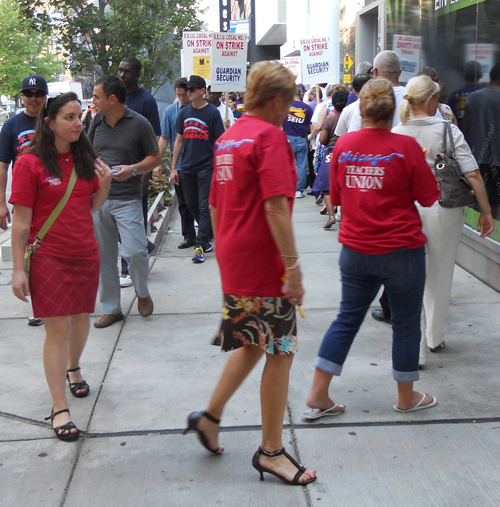 Chicago Teachers Union researcher Sarah Hainds (left) showing solidarity with striking security guards at 161 W. Kinzie building on September 1, 2011. Substance photo by George N. Schmidt.Good afternoon. My name is Sarah Hainds, and I’m a researcher for the Chicago Teachers Union. Thank you very much for this opportunity to address the Executive Committee. Like my colleague, Ms. Davis-Gates, I am also speaking in opposition to the HB4277 Amendment 1. Charter schools were supposed to be innovative incubators that were given autonomy from the district in exchange for finding creative solutions to improve education, and to share those innovative ideas with the rest of the district. Charters were given autonomy in exchange for accountability and that accountability, though legally undefined, has been commonly understood to mean higher educational achievement outcomes. While some charters are producing higher test scores than the city average, half of them aren’t. Research from across the nation is showing the same results, even research funded by the Gates Foundation and conducted by the Mathematica Institute — so it’s not just an anti-charter conspiracy. Every year, charter schools are expanding the number of campuses they operate in Chicago and recently, the Illinois legislature increased the state cap on charters. Now charter proponents are here to ask the cash-strapped state of Illinois to increase their per pupil expenditures. Why should the public spend more tax-payer money, especially during this recession, when we’re not afforded the right to know exactly what charters are doing and how they’re spending our money? CPS is about to radically change how it operates schools next year by implementing the Common Core, new teacher evaluations, and the unfunded extended school day. Now is not the time to increase charter per pupil expenditures. 2. Charters serve only 51% of neighborhood kids, according to the most recent CPS report. 8. CPS expenditures on charters is growing exponentially to $423,740,000 in 2012. I have been FOIA’ing for this budget since November and was recently told by CPS that they can’t comply because the Office of New Schools no longer exists; now it’s the Office of Portfolio Management. 9. According to pages 209 – 225 of the FY11 audit, nearly a quarter of traditional public schools in Chicago have lower per pupil expenditures than charter schools. Increasing the amount that charters get will mean that more traditional neighborhood schools will receive less and thus will be unable to provide the resources their students need to improve academic achievement. 10. Charter schools received $5.9 million from CPS this year for Small School Support – something that many neighborhood schools want and need in order to better serve their students. 11. There is no public oversight for how charters spend their money. When audits or annual reports are made available, they aren’t uniform and difficult to compare, as the Civic Federation stated. 12. Between FY11 and FY12, CPS expenditures on charters rose almost 16% while enrollment only rose about 12%. 13. CPS allocated $7.2 million in FY12 to support new charter schools. 14. The CPS per cap in FY12 is $9,519. All but four charter high schools received that in per pupil expenditures in FY11, which means they received 100% of the per cap. If that amount is allocated to all charter elementary schools, they will be getting $1,000 more PPE than the average CPS elementary school. 15. Finally, as my colleague Ms. Davis-Gates stated, there is currently a moratorium on legislative changes for charter schools until 2013. I respectfully request that we honor this moratorium, while we wait out the recession and we evaluate whether or not these charter schools are in fact “succeeding”. If public really means public, there should be public oversight of operations and expenditures.